Marshall has a fully equipped fabrication shop and a team of experienced fabrication personnel, enabling us to create a variety of unusual products for packaging, protecting, handling or installing art objects. We can cut, bend, drill, weld and assemble stands, frames, supporting structures and all sorts of items in metal, wood, concrete and other materials. For installation work, we can build concrete foundations or bases, strengthen walls or floors, and create custom-designed securing and hanging devices for even the most unusually configured objects. 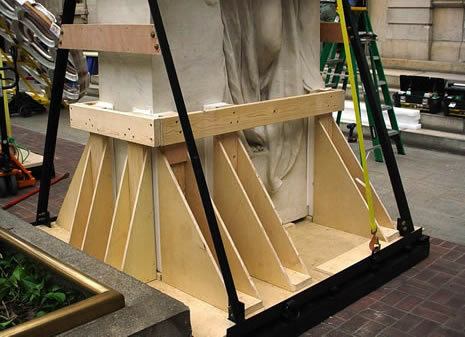 We can also build structural supports, metal frames and lifting baskets that better secure extremely heavy or extremely sensitive objects for transit. CLICK HERE to contact Marshall on fine art fabrication requirements or questions.